This year, Chinese smartphone maker One Plus will launch its flagship smartphone - OnePlus 7. A picture of this smartphone is on the internet, in which a pop camera can be seen with a bezel-less screen. A similar kind of smartphone launch was launched with the sliding design. According to leak slash, this is a prototype of OnePlus 7. Two smartphones can be seen in the alleged leaked photo. It is being told that onePlus 7 is one, while the other is OnePlus 6T. The upper part of this phone can be seen in which the slider is. 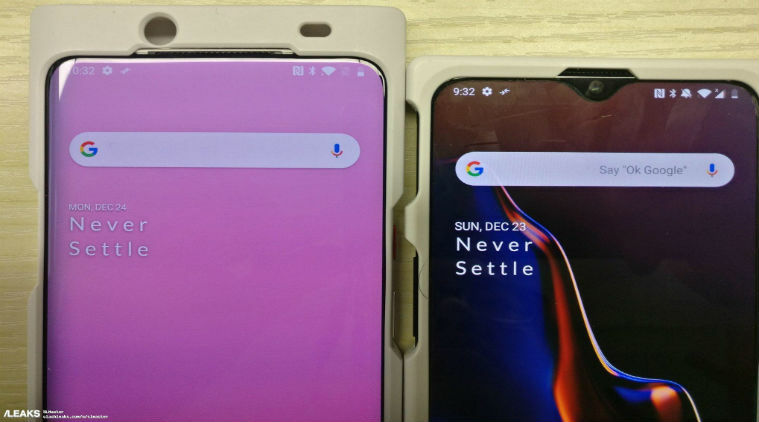 The phone on the left is being called OnePlus 7, while the phone on the right has a new variant of OnePlus 6T. In front of the smartphone i.e., there are not many cameras in the display nor above the display. For this, a slider can be seen which can slide from the back. It is also possible now that there may be a pop-up selfie camera like Vivo Nex or a slider camera like Oppo Find X can be given. According to reports, OnePlus 7 will be offering Qualcomm Snapdragon 855 processor and it will have three rear cameras. Clearly, the latest version will run on Android only. This time also, the company will provide under-display fingerprint scanner and this time it is special that 5G connectivity can be given in this phone. At present, the company has not told anything about this phone. Mobile World Congress is starting in Barcelona on February 20, and during this one, One Plus can also announce its device. Because here too more giants will present their concept.